I don't even know where to start on my love for Lil Blue Boo! Run by Ashley, a mom who used to work in investment banking but now stays at home with her 2 year old daughter, affectionately nicknamed "Boo," this blog is chock full of fantastic craft ideas. And how cute is this Frog Beanbag? Like what you see? There's lots more where all of this came from! Head on over to Lil Blue Boo and get ready to get inspired! Congratulations JASONLOVESSARA! You've won the butterfly wall art from Almost Sunday! Please e-mail me at afomft@gmail.com by end of day Friday, October 2nd to claim your prize. If I do not hear from you by then, a new winner will be chosen. Believe it or not, it's already getting cold here in Wisconsin (the low tonight is going to be near 30 degrees) and I'm totally unprepared. I'm desperately trying to find some cute winter accessories for my 6 year old daughter, Kayla, and my 3 year old son, Alex. Any suggestions? Thanks for the e-mail, Maggie! I love that even though you live in a super cold climate, you're still looking for something fashionable to keep your kids warm. And nothing fits that bill like the adorable fleece winter hats made by Little Lids. I know how hard it can be to get your little ones to wear their winter gear but with Little Lids, your kids can pick the hat style they want and customize the colors to their liking. And if they want to personalize it even more, they can even add their name. Katie from Little Lids has graciously offered 15% off all purchases of $20 or more to AFOMFT readers. Once you choose the hats you want, convo Katie to let her know you read about her store on AFOMFT and she'll set up a reserved listing with the discounted price. Please note that this discount does not apply to shipping costs. Want to get your say on A FEW OF MY FAVORITE THINGS? You're in luck because every Tuesday, our readers are in the driver's seat! Each week, I'll be featuring your favorite things, helping you solve your decorating dilemmas and more. So shoot me an e-mail at afomft@gmail.com if there's something you love that you want to share or if you're on the hunt for the perfect product and just can't find it. And every reader featured on YOU TAKEOVER TUESDAY will receive a special gift from AFOMFT. What are you waiting for? Hit us up! To Blog For a Cure! There are 10 giveaways up for grabs now and more to come. Grab the button and spread the word! Congratulations PYJAMMY PAM! You've won the initial tees from Savvy Sarah Designs! Please e-mail me at afomft@gmail.com by end of day Thursday, October 1st to claim your prize. If I do not hear from you by then, a new winner will be chosen. Head over to Who Knew? Reviews and click on the button to donate $1.00 to the Leukemia and Lymphoma Society. If you can donate more, please do so, but the minimum to participate is $1.00. This will earn you one entry into each giveaway that you comment on. If you would like more entries for a particular item, each extra dollar will earn an additional entry. Then, sign in to Mr. Linky and cruise the list of other participants, visiting a minimum of 5 blogs. Click “follow” when you get to those blogs. For each new blog follower that you get, return the “follow.” Feel free to visit and follow each and every other participant that signs in to Mr. Linky- think how many new followers you will receive! Feel free to check back all week long to meet new bloggers, and gain new followers! 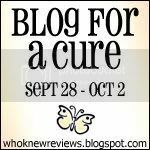 On September 28th, post something about the Blog For A Cure Blog Party on your own blog, including the link: www.whoknewreviews.blogspot.com. Feel free to copy and paste this text, and encourage all of your blog readers to do the same. If you do not care to gain followers for your blog, you can still will prizes by donating a dollar, and commenting on the prize posts that you want to win. If you do not want to donate, you can still help by blogging, tweeting, and posting on Facebook about this event, to help us spread the word and raise as much money as possible. Just imagine what a difference we could all make, if we all just donated ONE dollar. And other great items from Orglamix mineral makeup, Krizzy Designs, and Boojiboo among others. And be sure to keep your eyes peels for a great giveaway coming later this week sponsored by AFOMFT! There will also be a prize for the person who refers the most participants so when you get to the main link-up post, leave a comment that you were referred by AFOMFT and help me win a special, personalized gift from Stephie Mc Designs! If you post about the Blog For a Cure on your blog, you could be eligible for that great gift too. So what are you waiting for? Grab the button below to start spreading the word about this event! Let’s do something- together- to make a difference. Now that fall is in the air, need an easy project to occupy your kids when they can't go outside? Check out this adorable stuffed snake from one of my favorite craft blogs, Skip To My Lou. And if you can't sew, you can skip that step by using my favorite craft supply - Stitch Witchery tape. Then let your little one go to town! After the snake is decorated, stuff it and tie the end off with a piece of yarn. It doesn't get more simple than that! You can find the full instructions for this project and many many more at Skip To My Lou. Are you sick of my posts about things I discovered on my Internet quest for ideas to use at Gabrielle and Alaina's first birthday party? I hope not because you're getting another one today! How adorable are these ballerina cupcake toppers from Jadi at Homemaking Fun? They're a twist on these equally cute paper dresses from Composing Hallelujahs. Talk about perfect for a little princess! Making these ballerina or dress toppers is such an easy DIY project and they can be used so many different ways - as invitations, favor tags, place cards, even strung together as a garland. I think I have the theme for next year's birthday bash! You can find the step by step instructions at Composing Hallelujahs. Congratulations JENN MARON! You've won the Mommy tee of your choice from Glamajama! Please e-mail me at afomft@gmail.com by end of day Monday, September 28th to claim your prize. If I do not hear from you by then, a new winner will be chosen. Gabrielle and Alaina's first birthday party is this weekend and I've spent the past few weeks scouring the Internet for ideas and inspiration. I've discovered some amazing websites and blogs but find myself constantly going back to one in particular - Bakerella. Before we go any further, I have a confession to make. While I've often dreamt of whipping up beautiful pies and delectable cakes, I can't bake. I even got one of those glistening Kitchen Aid mixers hoping it would motivate me to attempt some sweet treats. Yet two years later, it still sits alone, gathering dust in a cabinet, never having been used. But now that I've found Bakerella, that's all going to change. Martha Stewart liked Bakerella's creations so much that she invited her on her show to demonstrate how to make the cupcake pops. I mean really, impressing Martha? Does it get any better than that? So even though Gabrielle and Alaina's first birthday party hasn't happened yet, I'm already planning their super sweet second. I'm envisioning a beautiful buffet filled with all of Bakerella's delicious desserts and a design-your-own cupcake pop station for the kids. You probably think I'm crazy but trust me, once you visit the site, you'll get the baking bug too!